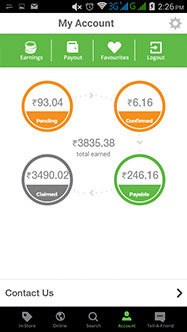 Download the free mobile app from TopCashback.in, India’s Most Generous Cashback Website. 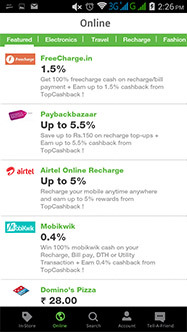 The TopCashback.in App is available in Google Playstore. 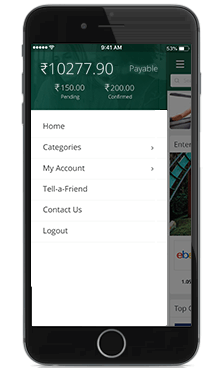 Downloading the TopCashback.in App will enable you to earn cashback on the move and keep you up to date with all the exclusive Cashback, coupons and deals. So, what are you waiting for? Get the app for your Android phone using the button below. Earn cashback on your online purchases by shopping from wide range of stores and make the best use of offers & coupon codes. All you need to do is find the retailer you want to shop with, select the "Get Cashback" button next to the offer and shop normally as you would and we will take care of the rest. 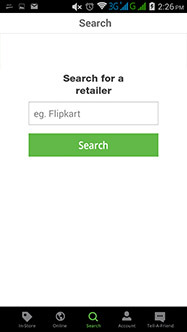 All you need to do is use the "Search" tool bar and find your favourite retailer. We feature some fantastic retailers – why would you ever pay full price again? There’s no need to boot up your computer anymore to do your online purchases. 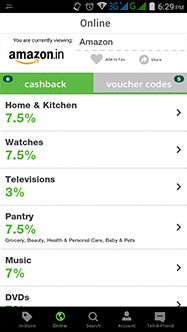 Shop online through your mobile to collect cashback and go even further with online coupon codes. On top of all that, you can monitor how much cashback you’ve earned, keep track of pending transactions and manage your favourite merchants. Keep TopCashback by your side wherever you go! Refer your friends and earn unlimited money with us. All you have to do is share the unique link which is available in your account with your friends. Once they sign up using that link and start earning cashback, you will get paid. It’s that simple. Just by sharing and you will earn money. After all, we do believe "Sharing is caring". Please go through our Tell-a-Friend "Terms & Conditions" for more information. 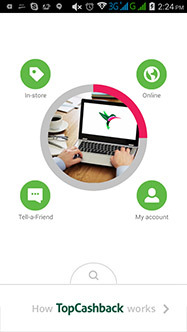 *Please note, the above screenshots are taken from our Android app. The features and appearance of the app may differ between the various platforms.